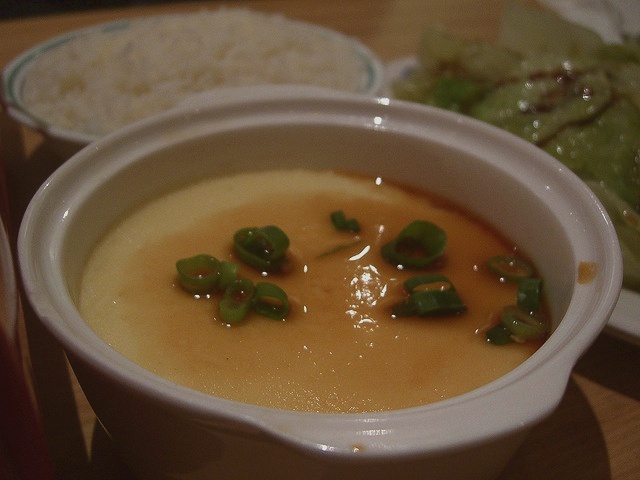 Chinese Style Steamed Savoury Egg Custard. Made with light soya sauce, water, eggs, salt, pepper and spring onions. Beat eggs with water, salt and pepper. Pour egg mixture into a bowl. Cover bowl with grease proof paper. Sprinkle light soya sauce, pepper and spring onions on top of egg custard. Serve hot. a) 90g chopped fresh prawns and a few strands of soaked mungbean vermicelli/sohoon. Cut into 10cm long. b) 1 tbsp pounded dried shrimps. d) 90g fish meat diced into small pieces. e) 90g diced fried fish paste. oh ok, this is how this dish is made. duh…tx! This was wonderful! I’ve been looking for a this egg dish for a while. just made it again and added chicken floss and wow! taste great. I’m from Suriname (Dutch Guyana). We mix in black beans, oyster-sauce and a mix of chopped pork and fresh/dried shrimp. Delicious! The best part is that this dish is so simple and versatile! Easily prepared. Soft and appetizing. Another excellent idea you have there! Add in some fried shallots if you like.